Hi! Hannah here. Since this is our first recipe post on Daisy Farm Crafts, I wanted to take a minute and explain a little bit about this new project. If you’ve been here before, you’ll know that for the past year my mom (and sometimes me) have used this blog to share patterns for the crochet projects we’ve been making. My mom first started sharing her crochet a few years ago on Instagram after reading an article about the importance of being a contributor to social media instead of just a consumer, so she decided to create an account for my little sisters to start sharing. Around the same time, my husband and I were officially diagnosed with infertility and she decided to focus most of her crochet on making baby blankets and embraced the Field of Dreams mantra in the hopes that maybe one of them might be the lucky blanket to welcome her first grandchild. My little sisters lost interest in the account, but my mom had found the crochet community and Daisy Farm Crafts sort of became Daisy Farm Crochets! It’s been three years since then and there still is no grandchild, but we’ve had a lot of fun designing baby blankets and turning her Instagram account into a blog. When we first started the blog, my mom did most of the creating and my sisters and I did a lot of the behind-the-scenes website stuff, but last year I learned to crochet and it’s been fun to share some beginner friendly projects (because I’m definitely still a crochet beginner!). But something we like to talk a lot about is the importance of understanding what it really means to master a craft. Mastering a craft means taking time to learn and practice, and being brave enough to try new things, which usually requires a lot of patience and humility. We’ve started to realize that most things in life are actually crafts, and require lots of study and trial and error to master. So in the spirit of learning something new, we’ve decided to take on a new craft and try to cook and bake our way through my grandmother’s recipes. As we’ve kept adding to this blog we’ve realized what an awesome record-keeping system blogging actually is because we can write down all these patterns and pass them down to future generations (as long as the Internet survives;) and we want to do the same thing with my grandma’s recipes! 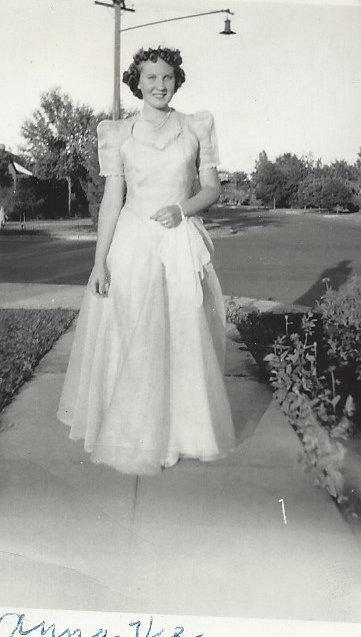 My dad’s mom, my Grandma Anna Vee, was a wonderful baker and cook and when my parents got married they received a gift of a great little box full of her recipes, some of which she won awards for at the county fair where my dad grew up in Arizona. Grandma Anna Vee passed away from cancer when I was 3 years old so my siblings and I never got the chance to really know her, but we’ve always had her recipes. As my dad’s family has expanded, I don’t know if everyone has access to them anymore, so my mom, my sister Nico and I decided we would cook and bake our way through the whole box and take pictures as we go, kind of like our own Julie and Julia project so that the recipes will all be online and easier for us all to access. As you can see we have a lot to get through! And this picture is only of the baking ones! I’ve always enjoyed baking, and my sister Nico’s always been more of a cook, so she’ll handle most of the dinner foods while I focus on the desserts and my mom will chip in here and there. None of us are baking or cooking experts so this will definitely be a learning experience for sure. I was looking through my half of the stack and there are a lot of breads and rolls and cakes that I’ve never made, so I’m sure there will be lots of trial and error! But I’m excited to get to practice this craft a little bit more and to get a little closer to my grandma through her recipes. I started out with Snickerdoodles because these are the cookies that remind me the most of my dad’s family. My dad grew up in a small ranching town in Arizona and every summer my siblings and I would get to go and help with the cattle drives and someone would always have a bag of Snickerdoodles when we’d stop for lunch. I was a little rusty at my cookie making when I made this first batch – I couldn’t remember if I had put in eggs and so I added extra at the end and I think I may have accidentally doubled the eggs. The cookies turned out a little cakier than usual, but they still tasted amazing. Also, when my grandma says ‘soft shortening’ I assume that she means Crisco vegetable oil shortening, and that is what I used, but my mom has also made these cookies before using butter and they turn out the same. The recipe is fairly straightforward, so my only advice is to pay attention to how many eggs you put in :). Also as you can probably tell I didn’t roll the cookies into the size of small walnuts – I just used my cookie scooper – and they turned out just fine. I’m not sure why, but my dad always told me that his mom loved to make really tiny cookies. Maybe so she could feel less guilty about eating more than one at a time :). Thanks for stopping by! If you’d like to follow our journey of making these recipes you can follow us on Instagram @daisyfarm.recipes! And of course, you can always find my mom @daisyfarmcrafts! Soft, chewy and delicious cinnamon sugar cookies. Mix shortening, sugar, and eggs. Mix together dry ingredients and add to dough. Roll into balls the size of walnuts. Roll in cinnamon-sugar mixture. Place two inches apart on ungreased baking sheet. Bake until lightly browned but still soft. (These cookies puff up at first, but then flatten out). Do not overbake. Bake at 375 degrees for 8 to 10 minutes.